The beauty of the Great Smoky Mountains is endless. Every turn taken and every mountain crested provides way to another jaw-dropping view. Explore this beauty on one of many scenic drives around the area. A wonderful day trip experience, pack a lunch and have a picnic roadside in the many parks and trails along the way! - "America`s Favorite Drive" starts in Cherokee. Beautiful mountain vistas, wildflowers, hiking, picnicking. - Scenic 50 mile drive from Robbinsville NC to Tellico Plains TN. Leisurely drive with overlooks; highest elevation 5,400 ft.
- 118 curves in 11 miles. Perfect for sports cars and motorcycles. Easily accessible WNC waterfalls in the Great Smoky Mountains National Park, Cherokee, & Highlands NC areas. On the other side of the tunnel, the pavement ends and the Lakeshore Trail begins (it continues for 35 miles to Fontana Dam!). The Goldmine Loop Trail starts about a half mile past the tunnel on the left (look for the sign). Pass the first trail on the left, the Tunnel Bypass trail that takes you to campsite 67. A short distance beyond is the Goldmine Loop Trail on the left. Turn here and head down a ridge to an old homestead with the remains of the chimney. From there, continue on to follow a cascading Goldmine Branch through a forest. In about a half mile, you see the other end of the trail to campsite 67 on the left. Continue straight ahead along the branch for another quarter mile for to a view of a cove of Fontana Lake. From there, take the trail uphill for a long and strenuous climb. In about a mile, you`ll reach the intersection of the Tunnel Bypass Trail (and the end of Goldmine Loop Trail). Bear right at sign that says "parking 4/10 of a mile" to return to parking area. Or for a longer way back, turn left on the Bypass Trail to return to the Lakeshore Trail and walk back through the tunnel. Home to premier whitewater rafting and kayaking, this is a beautiful scenic drive right next to the water with plenty of pull-offs and picnic spots. Great Smoky Mountains National Park is filled with scenic roadways waiting to be explored! 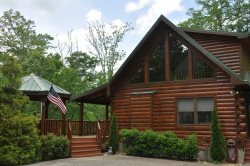 With views of Newfound Gap and Clingmans Dome visit nearby Cades Cove and other cool area attractions.